Obi-Wan Kenobi seems to have gotten tired of hitching rides in that Skywalker kid's battered old X-34 landspeeder and got himself a green Toyota, which he crashed while trying to squeeze between two lanes of stopped cars. This occurred in Roseville, CA and not Mos Eisley, Tattooine. Then he drove away, causing both a great disturbance in the force and, soon after, his arrest. 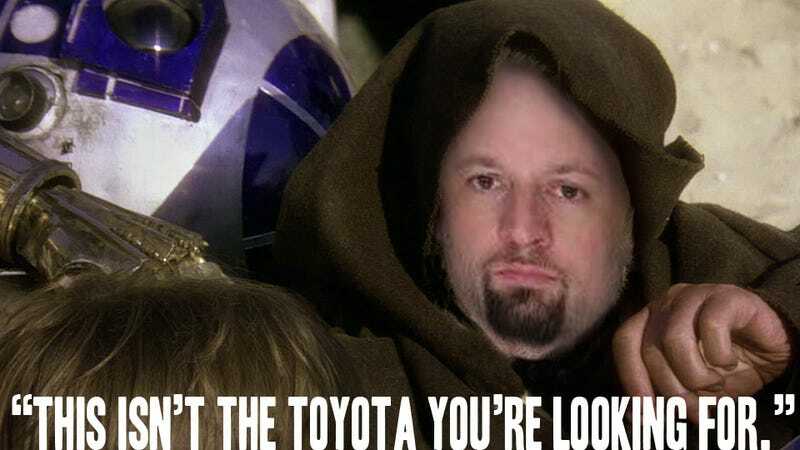 Kenobi, who may in fact just be some 37-year old dork legally named "Obiwan Kenobi," was charged with hit-and-run and an unrelated petty theft charge. Though it's not mentioned in the article, sources suggest he had stolen an R2 unit and a protocol droid. When questioned by police, he repeatedly insisted that the droids were not the ones sought by the police. He also waved his hand in a strange manner while speaking.